The Indianapolis Regional Airport (MQJ) is a vital reliever to the overall system of airports serving the Indianapolis metropolitan area. 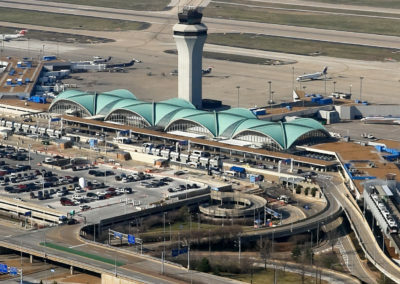 The 2007 Master Plan for the Indianapolis Regional Airport identified a 500-foot extension to Runway 7 as a near-term development item and the airport hired Crawford, Murphy & Tilly (CMT) to provide design services for the expansion program. This improvement was needed to provide enhanced operation of existing business jets with increased takeoff weights. 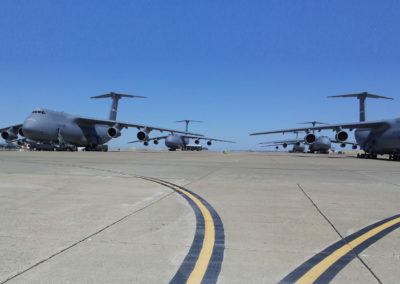 CMT was charged with accomodating these business jets and improving safety margins during inclement weather conditions. 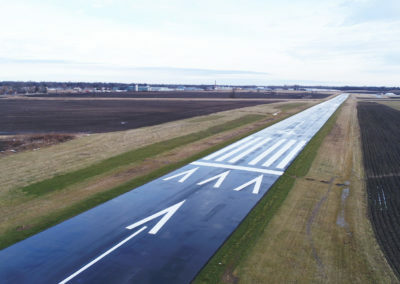 CMT coordinated the phasing with the fixed base operator (FBO) and the Indianapolis Airport Authority (IAA) in order to minimize user impacts and shorten the needed closure time of the runway. Phase one of the project included the relocation of the Runway 25 localizer antenna and equipment shelter for compliance with Runway Safety Area (RSA)/Object Free Area (OFA) criteria for category C/D-II operations. Due to the proximity of the existing localizer to the runway extension, the antenna array and shelter needed to be relocated in accordance with FAA design criteria. CMT designed the relocation of the antenna array and suggested a new shelter outside of the OFA be constructed. This minimized the downtime of the existing localizer and provide the needed space for future upgrades. CMT produced plans and specifications for the first design package in less than 90 days. Phase two consisted of extending Runway 7 and Taxiway A by 500 feet, along with connecting Taxiway A-5. The runway extension was designed for an asphalt pavement structure and the taxiway was a concrete pavement structure. The existing PAPI system was relocated as part of the project, along with installation of LED taxiway edge lights, a new LED windcone and new LED REILs.